One the eve of her Dokimi ceremony, which will determine if she is worthy of the crown, Serafina is haunted by a strange dream that foretells the return of an ancient evil. Serafina, daughter of Isabella, Queen of Miromara, has been raised with the expectation – and burden – that she will someday become the ruler of the oldest civilization of the merfolk. One the eve of her Dokimi ceremony, which will determine if she is worthy of the crown, Sera is haunted by a strange dream that foretells the return of an ancient evil. But her nightmare is forgotten the next day as she diligently practices her songspell; eagerly anticipates a reunion with her best friend, Neela; and anxiously worries about Mahdi, the crown prince of Matali, and whether his feelings toward her and their future betrothal have changed. Most of all, she worries about not living up to her mother’s hopes. The Dokimi proceeds, a dazzling display of majesty and might, until a shocking turn of events interrupts it: an assassin’s arrow wounds Isabella. The realm falls into chaos, and Serafina’s darkest premonitions are confirmed. Now she and Neela must embark on a quest to find the assassin’s master and prevent a war between mer nations. Their search will lead them to other mermaid heroines scattered across the six seas. Together they will form an unbreakable bond of sisterhood as they uncover a conspiracy that threatens their world’s very existence. Can a dress change your life? If it was made by the late Alexander McQueen, then quite possibly yes. Two years ago, I was casting about for a new idea for a novel, and I was coming up dry. Which is a terrifying thing for a writer. I’d written five historical novels and I wanted to do something new. Ghosts from the past had inspired all my stories: A Northern Light, Revolution, and the Rose books, and I was grateful to them, but I needed to get away from them. Ghosts are beguiling creatures, but sitting with them in a room day after day is tough. They give you their stories, but take pieces of your heart in return. I was spent. I was done. My next story was going to be different. If only I could come up with it. Looking for inspiration, I went to the Met in New York City. 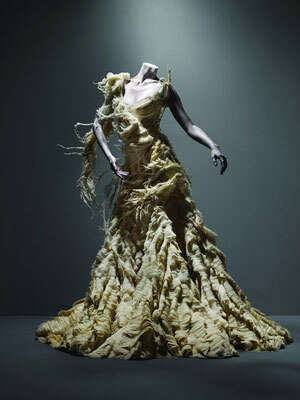 The museum was staging a retrospective of Alexander McQueen’s work. As you may know, McQueen was a clothing designer – a brilliant, troubled man who took his own life in 2010. In hindsight, this might not have been the best place to go for ghost-avoidance. McQueen’s collections were shown in dusky jewelbox rooms and walking through them felt like walking through a dark fairytale. In some rooms, music played. In others, the wind howled and wolves cried. And the dresses – they were so beautiful and fierce, it almost hurt to look at them. They were made of cloth and thread, but of other things, too. Of antlers and skulls. Thorns, flowers, feathers. Love, longing, desire, regret – these things were bound into every stitch. I could feel them. As I could feel him. McQueen. He was there, moving through those rooms. I moved through the rooms in a daze, past dresses inspired by history, pop culture, wild animals. And then I came to the last rooms, to collections inspired by the sea. And they blew me away. There were dresses that looked as if they’d been cut from white waves or fashioned from seaweed. There was a gown made of razorclam shells, another made of abalone. There was the sound of water lapping, and overhead – on a large screen – there was a video of a young woman sinking slowly through the water, her dress billowing around her. Who was she? Ophelia? Viola? I didn’t know. All I knew is that I was spellbound by McQueen’s vision of the sea – a sea that was beautiful and captivating, but also treacherous and dark. I knew then and there that I had to write a story about it. So yes, I was done with ghosts, but they weren’t done with me. Because to this day, I believe that Alexander McQueen sent me a gift from that great catwalk in the sky. So there you have it. My new project. It’s a sea change for me on one level, I suppose, but to me, it doesn’t feel that way. It’s another story that has consumed a big chunk of my heart. Another piece of me committed to words. Another group of characters who have set up shop in my soul and are now family. Deep Blue is as mysterious as its title suggests. And (hopefully) funny, carefully-wrought, and full of the emotion and the truth I try to bring to all of my stories. I’m looking forward to sharing Deep Blue with my ten-year-old daughter and her friends. Theirs is an age group that I’ve long wanted to write for – one that’s fearless and full of wonder. Bemused by boys. Fierce about friendships. Standing at the borderlands of childhood, suitcases in hand. I hope they find the mermaids of Deep Blue worthy travel companions, and that they come to love them as much as I do. Buy Deep Blue at Amazon.com, Barnes and Noble, or your local independent bookstore. Hello , my name is Salomé and I am french I had read the waterfire saga and it was revelation for me , althougt the story is exciting I was touched by the universe and the imagination , I love reading books and I love also the story of the world. I am in awe in front of the universe of these books. I read these four books in four days. I have plunged into the books as the mermaids have plunged into the mirror. You brought me an extraordinary new feeling. Thank you for all. I have got just a question. Is there a sequel to the waterfire saga ? I am sorry for the linguistic mistakes this is my fourth year of English. Y\I love you so much, you are one of my biggest inspiration as a writer. I’m corrently doing a 17 paragrapgh boock report, and I had to do Deep Blue. The romance, tragideiy, and adventure was what I love most about the book. Thank you for wrting such a magnifient story. One day I hope to wrie as well as you. Aww, thank you Anna! 😘💖😉That makes my day! Good luck on your book report! Hi Arieona: No plans for a fifth book at the moment, but if that changes, I’ll let you know! I am a big fan of your WaterFire Saga books. As soon as I saw “Deep Blue” I was pulled into the world that you created. I begged my parents to buy me the rest of series. I absolutely love your books. I often reread them. So to my questions: Have you won any awards for the WaterFire Saga? I am also recommending your book in my English class. Thanks! Yes! Deep Blue won the Green Earth Award for environmental stewardship (http://www.natgen.org/green-earth-book-awards/), and I’m incredibly proud of this award. The series is very much a plea to readers to take care of our precious water systems and the creatures who inhabit them, and it means so much to me for the books to be recognized in this way. I just want to say that this series has really changed my life. I actually picked up this series, but unfortunately set it aside when I was in high school. Recently, I decided to pick it back up and found this series not only set the imagination on fire, but it also inspires me to reach outside my comfort zone and reach for goals that I have been set aside. I went ahead and ordered the rest of the series and finished all of them about 2 days ago and I was wondering when book 5 would be coming out. Thank you, Mrs. Donnelly, for sharing this amazing world with us. Hi Ashley: Thank you for your lovely comments — and so happy to hear you’re stretching to pursue your goals! There’s no fifth book in the series in the works at this point — but maybe one day! I’d love to catch up with the merls again … I miss them!